To an even greater extent than Buckle’s Nijinsky (1972), this study of the Russian Ballet’s impresario-visionary fails as a biography while succeeding mightily as a juicily researched, tapestry-detailed chunk of cultural history. Middle-class, musically-educated Diaghilev–that self-declared “incorrigible sensualist” and restless devotee of “art for art’s sake”–certainly was a charismatic catalyst, a tastemaker, even (as Buckle Claims) a “creative genius”; and he easily holds center-stage during his youthful 18901905 exploits–organizing exhibits of new painters and old Russian treasures, publishing (with Bakst and Benois) The World of Art, feuding as sometime-employee of the Imperial Theatres. But soon after Serge’s historic Paris presentations of Russian ballet and opera lead to the formation of his own revolutionary dance company, his famous collaborators and the works themselves begin to eclipse any biographical portrait: Stravinsky’s Firebird, Petrushka, Rite of Spring, Les Noces; Poulenc, Satie, Prokofiev; designs by Picasso; concepts by Cocteau; and, of course, the choreographers, from Fokine to Balanchine, including the famous series of lover-proteges so jealously raged over–Nijinsky, Massine, Anton Dolin. Ups, downs, controversies, betrayals, elopements, letters (To Stravinsky: “You awful pig. . . “), telegrams, rehearsals, opening nights, tours, bankruptcy–all described in dense detail, without real eloquence perhaps, but with enough shrewdness to puncture myths and raise pointed queries. 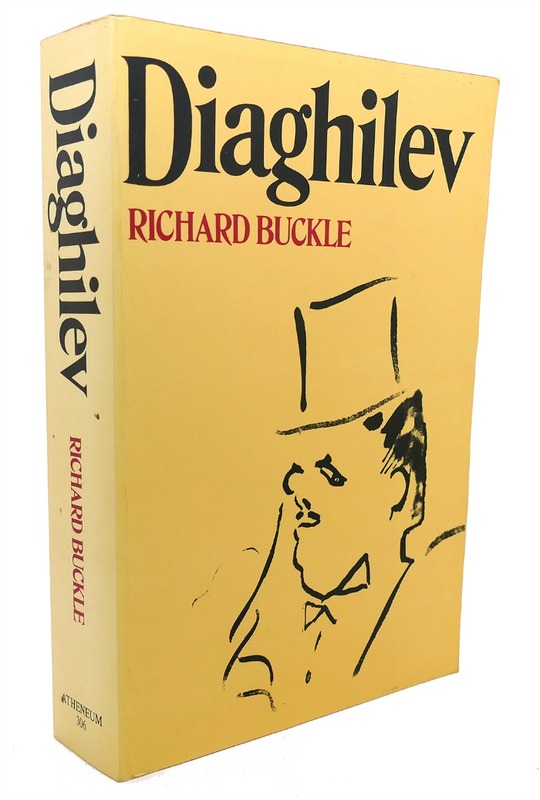 Richard Buckle “DIAGHILEV”, 1st Edition Thus 1st Printing New York Atheneum 1984.